If your halls don’t have any overhead lighting, walking down them can feel like a scene from The Shining. Get some lighting in there so you don’t have to hurry through the area at night or rummage around in any hall cabinets in the dark. Staircases are great opportunities to feature a classic midcentury pendant lamp—simply hang the piece from the area over the stairs, where no one will bump their heads. Who says you can’t feature art in a hallway? 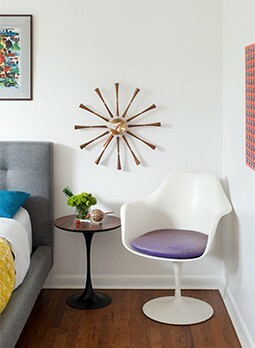 Once you have adequate lighting, you can use your hall or staircase to display art, midcentury pottery or other collectibles you’ve picked up along your MCM journey. Hang a single piece on the wall against the stair landing, where you’ll view it every time you walk up the stairs. You could also turn your hallway into a miniature art gallery and hang a small artist plaque next to each piece so visitors can enjoy your MCM art just as much as you do.